Welcome to the Team In Training Georgia Chapter's blog! We are proud to provide our teammates, coaches and Honored Heroes a forum to share their passion for our program. We hope you'll be inspired. Go TEAM! Deke Copenhaver is the mayor of Augusta and is set to do his first Team In Training event at the 2010 Ironman 70.3 Augusta. Deke draws his inspiration for TNT from two local boys in Augusta who are both dealing with leukemia. Brittany Banker, a TNT alumnus since running her first event in 2008, is a cancer survivor and single mom. Now also an assistant coach with the TEAM, Brittany shares her recent Ironman Louisville finish experience. “Daddy, it’s not wake up time. The sun is still asleep”, said my three year old, momentarily befuddling his intensely drowsy father. He was right, and sitting on the side of a strange bed in Peachtree City, I was overwhelmed by the urge to heed his advice. But a glance at the desk brought my jersey into focus, the Team In Training jersey soon to be on the backs of so many remarkable friends. It was time to ride. I have had the good fortune to wake up next to my beautiful wife most mornings for the past six years as well. More mornings than I care to recall, however, the rail of hospital bed separated us as she fought through her latest treatment for Hodgkin’s lymphoma. But on the morning of August 29th we rose together, along with our son, to be a part of the Team In Training that has meant so much to us, that has raised, nationally, over $1,000,000,000 for blood cancer research. After overwhelming the stunned breakfast steward at our hotel, the green and purple swarm rolled south, to East Coweta Middle School. Local and regional rides generally abound with warmth and energy, and the Wilson 100 proved an excellent example from the moment we were shepherded though our arrival by the multitude of volunteers. The team coalesced on our blue minivan, a mix of multi event veterans, century virgins, supporters, and one tricycling three year old. Our venerable coach called the team to order, and following the reading of “Close the Door When You Leave”, our traditional inspirational poem, we were off. 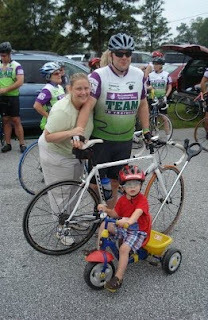 As the team turned right and headed out for mile one, my son implored his mother to push him along with us on his tricycle. His mother later informed me of his immense disappointment when he could not keep up. Our ride followed some roads southwest of Atlanta, roads we had seen in our training. As the miles passed by we settled into the pace groups forged over the season and passed the miles singing badly and telling bawdy jokes. When hunger or thirst arose, we soon found ourselves under the care of locals wielding water and peanut butter sandwiches. After chattering along the chip seal from Greenville to Warm Springs, team members glared at the Warm Spring Wall that had proven such a formidable training foe, enjoyed the support of the Team In Training SAG stop, and turned for home. Enduring a torrential downpour at mile 65, a flat tire soon after (the changing of which was truly a team event), an uncooperative rear derailleur, and an unplanned extra hill climb, we powered through the closing miles of the ride. As made our last turn towards the finish, our first time participants moved alongside each other at the front of the pack, and we followed these newly minted century riders across the finish. Barbeque, beverages, hugs and pictures closed our Wilson 100. Following my group’s arrival, our teammates rolled in to rousing cheers until our final participant, struggling through injury but unbowed, turned left into Coweta Middle School. She too was feted with hugs and pictures, testament to the enduring power of fellowship and support. Author of "Voices from the Edge: Life Lessons from the Cancer Community"
Julian Cowart first joined Team In Training in 2005 and has completed almost a dozen events with the Team. Now a coach for the cycling program, Julian is leading the Team at the 2010 Six Gap Century Ride. A few weeks ago, I had the privilege of being able to address the Atlanta TEAM at this season's All Sport GTS. One of the messages I hoped to convey was the all too often unrealized, sheer awesomeness of the group of people we train with every week. I've had the opportunity to be part of several TEAMs over the past two years, and I continue to be amazed by the people I have met, so, since public speaking isn't my forte', and some of you may not have been at the All Sport, I wanted to share this story with you again. It is difficult to tell much about someone when you first arrive at a Saturday morning run. You may be wearing the same TEAM jersey that many of them are also wearing, so it's hard to tell who's who. It may be a little intimidating waiting for the coach to address everyone; some of the people seem to know everyone and talk about upcoming races, while others are nervously anticipating the start of the run. But if you take a little time once the group gets started, and talk to one person, you will quickly realize you are in the presence of some of the most incredible people you will ever meet in your life!! Trust me, it happens to me several times every season, and it is not because they are all gifted runners (although you may meet some that have run over 100 marathons). They are incredible just because they are there, as are you, and you will help each other throughout the season (often without even knowing you're helping). You won't know at first that they are lawyers, vice presidents of corporations, doctors and even celebrities. They won't tell you they have been participating and supporting The Leukemia & Lymphoma Society for over ten years, or they've been acknowledged nationally for their contributions, they're far too humble to boast. If you take the time however, you may find out one of them is an alumni in your college fraternity or sorority, or they just took a week off their job to travel across the country supporting a TEAM on the Race Across America. You may have an opportunity to hear they are participating because they lost a loved one at some point, or they participate because they can't cure the disease but they can run, so that's what they'll do. You might not even meet the person who inspires you "in person" at first, you may become friends with them because you saw their story on the TNT Georgia Facebook page, and became friends with them via the internet until you have an opportunity to meet them at an event. I know this because every one of these has happened for me in the short time I have been on the TEAM, and each person I have met along the way to my finish line now have a special place in my life forever. So I urge you, take time to get to know someone each week at your GTS and you will be rewarded with relationships that will last a lifetime. By the way, if you are reading this blog, I now consider you my friend, and I hope to get a chance to talk to you sometime soon at a GTS or event to hear your story. Until then, Train, Endure, Achieve, Matter, and GO TEAM!! Bruce Scruggs first joined Team In Training in 2009 and has quickly racked up several TNT events under his belt. Next up for Bruce, the 2010 Chicago Marathon. I can't believe that the Nike Women's Marathon is only six weeks away! What a season we have had so far! Friendships have been made, miles have been logged, money has been raised and we are hopefully only going to have cooler temps from here on out!. I just wanted to say with the race so close--Nike Team, it has been my honor to be your honored hero, THANK YOU! The encouragement, tenacity and support you all have graciously bestowed upon me has made me even more appreciative to be apart of the Team In Training family. So, with that, I wanted to share another aspect of why I am apart of TNT. Yes, being a cancer survivor is a blessing. Yes, research for a cure is important. Yes, it's for those patients still fighting and those who lost their lives. But it's also so much more. I've flashbacked to when I was sitting in the emergency room over 10 years ago waiting anxiously for my test results. At that moment I wish I could have been alone. I wish it could have just been me, the doctors nurses and anyone else who worked at the hospital, but it wasn't. As I was in a daze being told terrible, change your life in a second, type of news.... there sat my mom. Her eyes filled with tears, her heart breaking, her world crumbling...she had to witness the "you have cancer" diagnosis. The fact that she was a mere bystander to the words that I had Leukemia and that I could die in two weeks still haunts me! It's one of the most painful memories I have from my entire experience with cancer. Parents should NEVER have to hear that the son/daughter they have raised, loved, and nurtured get diagnosed with a deadly disease. No matter how old they are. When those words "you have cancer" came out of Dr. Morris's mouth I turned to my mom and I smiled. I told her that it was going to be ok. I was going to be fine and she had nothing to worry about. I became the parent. I comforted her. I was watching her watch me and all she saw was my life flashing before her eyes. Why am I a part of Team In Training? Lance Armstrong said, it's because I have an obligation as a cancer survivor, but for me it's for the parents, siblings, family members, friends and caregivers. I hope there comes a day that they no longer have to hear someone they love is sick. To all the members of Team In Training Fall events, what you have done this season has not only helped those who are sick but those caregivers who have been just as affected.... so, Thank You, Good Luck and GO TEAM! Mitzi Jiles has been a part of Team In Training since 2007 and is doing her third TNT event with the 2010 Nike Women's Marathon, her first marathon. 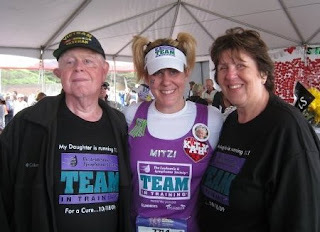 As an acute myeloid leukemia survivor for the last nine years, Mitzi is one of our Honored Heroes and motivates us all to continue the fight against cancer. Thank you Mitzi for the inspiration! 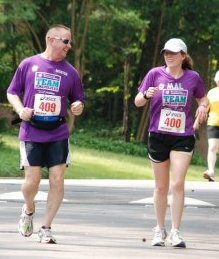 Since 1988, The Leukemia & Lymphoma Society's Team In Training has grown to become an unparalleled sports training program. More than 500,000 participants, from first timers to seasoned athletes, have trained with the Team and achieved their best at marathons, half marathons, triathlons, 100-mile century bike rides and hiking adventures. In exchange for unsurpassed endurance sports training and support, participants raise money to help The Leukemia & Lymphoma Society find cures for blood cancer. Train with the best to meet your challenge. Together we train to beat cancer! © 2010-2011 Team In Training - The Leukemia & Lymphoma Society. Powered by Blogger.